Accreditation by the World Council on Preventive Medicine (WOCPM)! Magnesium is an essential mineral that occurs in almost all body cells. It is a popular mineral in anti-aging medicine. Magnesium plays a key role in many different metabolic reactions in our body. Magnesium adds to the fitness and is good for muscle function. 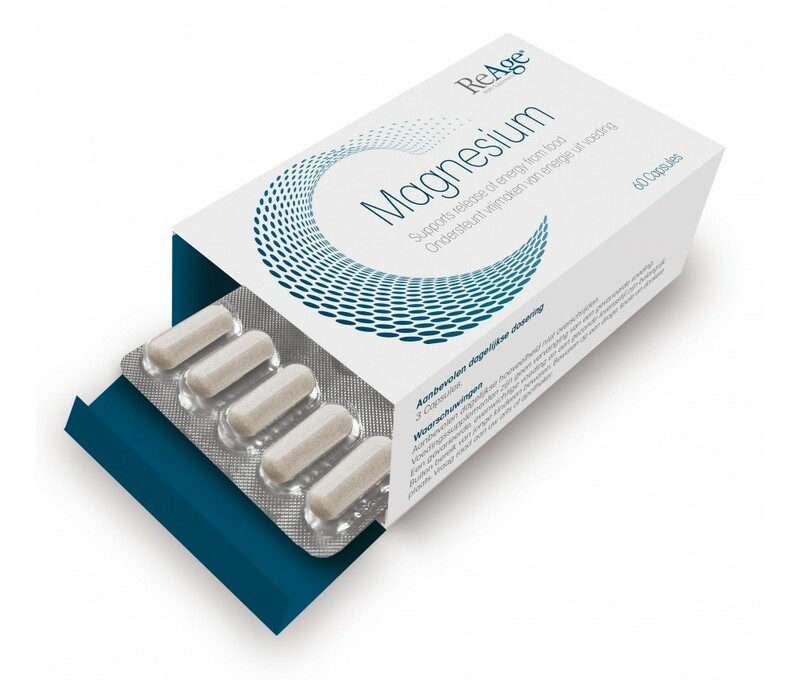 Magnesium supports normal muscle activity and is important to keep the muscles smooth. In addition, magnesium plays a role in the stimulus transfer between (nerve) cells, the synthesis of proteins and helps to generate energy from food. In addition, magnesium ihelps with tiredness and fatigue. 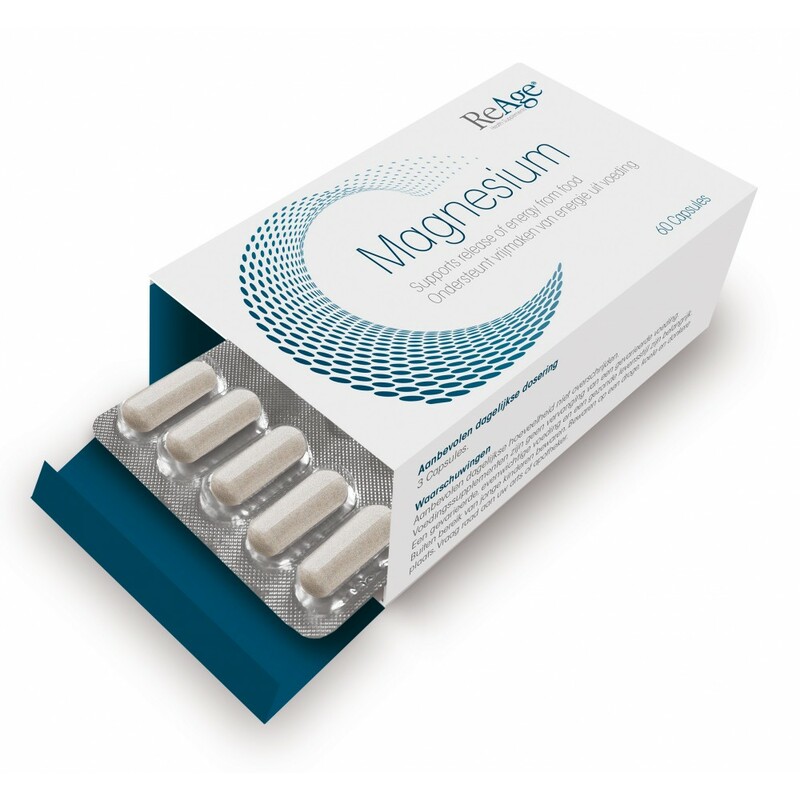 Re-Age Magnesium is a special formula that is well absorbed in our body. 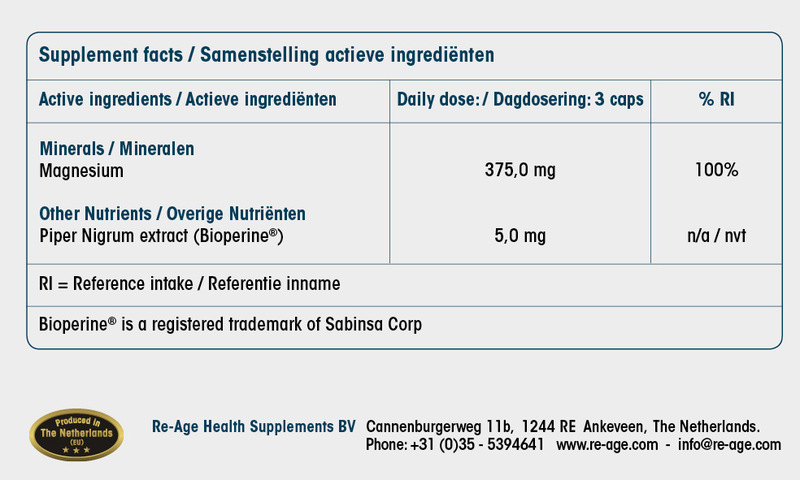 Re-Age Magnesium has a high bioavailability, partly due to the addition of Bioperine. Due to the binding to the amino acid Glycine, Re-Age Magnesium is not immediately excreted through the kidneys into our urine. Due to the binding of glycine, Magnesium bisglycinate is too large for that to happen immediately, thus keeping the magnesiumt longer favailable for all cells in our body. A unique formula! For both men and women. Due to the binding to the amino acid Glycine, Re-Age Magnesium is not only greatly absorbed, it is also not immediately excreted through the kidneys into our urine. Magnesium bisglycinate is too large for that to happen immediately, thus keeping Re-Age Magnesium longer favailable for all cells in our body. Blisters: hygienic, long shelf life & easy to travel with! Testosterone!Testosterone levels start to decrease around the age of thirty. Free testosterone level.. Male Factor 2 works together with Male Factor 1Male menopause is a natural process that all men expe.. Male enhancementMale menopause is characterised by a decrease in testosterone production. This start..
During menopause, many women experience mood swings, fatigue, night sweats, hot flashes and trouble ..
Femeno 2 works together with Femeno 1Already before menopause, oestrogen production starts to slow, ..
Sleep through!There is an increasing awareness for the role that daylight plays in a good night's sl..